Summary: Writing project sites across the nation are gearing up for the National Day on Writing on October 20, 2009. Teachers have planned writing marathons, family writing nights, author readings, student readings, and more. As the first-ever National Day on Writing draws closer, teacher-consultants across the country are building buzz by planning imaginative activities for teachers, students, and the community to enjoy. Created by the National Council of Teachers of English (NCTE) "to help make writers from all walks of life aware of their craft," the National Day on Writing will be celebrated in a number of ways. In South Carolina, for example, the Lowcountry Writing Project is gearing up for the October 20 celebration by holding a downtown kickoff event the day before, where the mayor will speak, state poet laureate Marjory Wentworth will do a reading, and several local writers will join student writers to present their work in public. Lowcountry site leaders have also created a National Day on Writing packet of sample assignments (PDF) for teachers of different grade levels to use in their classrooms. Finished products can then be read at the local event, "Celebrate the Lowcountry through Writing," or possibly submitted to NCTE's National Gallery of Writing —a centerpiece of the National Day on Writing—where dozens of writing project sites, including Lowcountry, have already started local galleries to showcase their pieces. Lowcountry is also planning a writing marathon event as a follow-up activity. Organizers say the National Day on Writing is supporting the work of the Lowcountry Writing Project in one big way—public awareness. "It gives us a way to get our name and our brand out there in front of more teachers, as well as administrators and policymakers," said Site Director Tom Thompson. It gives us a way to get our name and our brand out there in front of more teachers. Meanwhile, at the Arkansas Delta Writing Project, teacher-consultants have been busy sponsoring and hosting mini writing marathons and working through process pieces with students in time for them to be displayed in the local gallery. "Too many of our young people have produced too many essays just for the purpose of testing in the recent past and need venues for sharing their lived experiences through writing," said Site Director Dixie Keyes. "Our teacher-consultants understand this because of their experience in a writing workshop setting and a writing marathon of their own this past summer." Keyes said the site was purposeful in allowing its teacher-consultants to drive the focus of their activities. "This ensures that their voices are dominant in the events they may create," said Keyes. One teacher-consultant, Angela Johns, organized a "family write night" called "The Harvest of Words" with the motto "Feed your body, your mind, and your soul." She also invited author A. LaFaye , who will speak at Johns' school on October 19. Johns plans to invite another author next year in an effort to boost gallery submissions in the future. Johns also wrote a proclamation to declare November National Family Literacy Month in Arkansas. At the Eastern Michigan Writing Project (EMWP), teachers are doing a number of things according to eMuse , the site's blog. Of particular note, the site will host mini marathons on campus all day on October 20, and also set up stations where writers will have a chance to try out fun and inspiring forms of writing and share. "The best part is the visibility of writing on the campus and the message that everyone is a writer," says EMWP Site Director Bill Tucker. Writers will also have a chance to check out a Flip video camera and a "press pass" and have 20 minutes to walk around campus to interview faculty, students, and staff about their writing practices—an activity inspired by NPR's StoryCorps program. "We thought interviews about writing practices would help represent the purposes for writing we share at the university," said Tucker. Numerous sites are also creating local galleries in the National Gallery of Writing—and sometimes expanding the traditional notion of writing in the process. For example, James Bucky Carter set up a comics gallery through the National Gallery of Writing titled "SASSY: Sequential Art Stories Submitted by Youths!" The gallery exclusively features graphic narratives—comic strips, comic books, and graphic novels. Carter has started a discussion in NWP's Book Group Ning about SASSY. "Sequential art narratives involve advanced writing and composing skills too," says Carter. "Anyone can submit a work of sequential art to the gallery, but, as curator, I am especially interested in works from students and from classes or programs where comics composing is being taught." 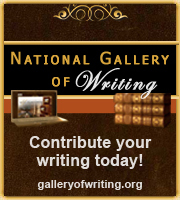 At the national level, NWP is pleased to be a partner in the National Gallery of Writing, created by NCTE to provide an occasion to celebrate the foundational place of writing in Americans' personal, professional, and civic lives, and to point to the importance of writing instruction and practice at every grade level, for every student and in every subject area from preschool through university. NWP's gallery will feature writing from this summer's E-Anthology. According to curator Shirley Brown, "This means that the broadest category of sites can participate through the wonderful work of their summer institutes." To find out more, download the National Day on Writing flier (PDF) and share it with your colleagues, students, community members, and friends and visit the official National Day on Writing page , which offers a variety of resources. You can also swap ideas with other sites on a discussion dedicated to the National Day on Writing on NWP's Site Leaders Ning . Please let NWP know what site activities you have planned by emailing nwp@nwp.org.